Whether you’re a live performer, a mobile DJ or need a front of house system for your bar or cafe, this PA package offers everything you need to amplify a variety of sound sources in different live environments. 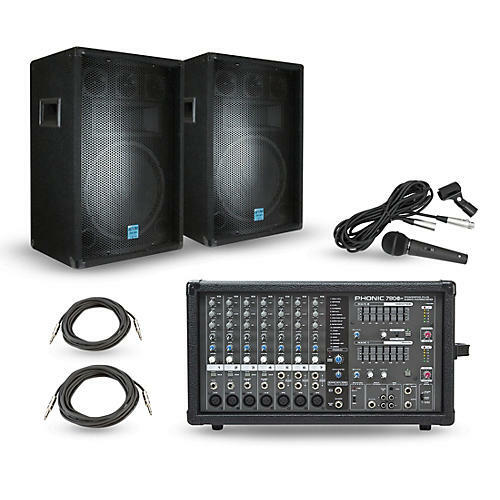 Built around the compact yet durable Phonic Powerpod 780 Plus 7-channel mixer, with two Gemini GSM-1260 12-Inch Passive Loudspeakers and two cables to connect the speakers to the mixer, this package covers all your bases, delivering professional sound at a welcome price. You’ll be setup in minutes and won’t have to fuss with complicated EQ or routing to dial in a great sound. With this convenient package, you’ll spend less time worrying about the sound of your gear and more time focusing on your performance. The Phonic Powerpod 780 Plus is a 7-channel powered mixer built into a compact and durable molded cabinet. The Powerpod 780 mixer has a built-in 300W + 300W / 4-ohm stereo amplifier which is patchable. 2 super Hi-Z inputs, optimized for direct instrument input, allow guitars and other instruments to be patched. The Phonic Powerpod 780 mixer features onboard digital effects, 32/40-bit digital effects processors with 16 preset programs plus parameter control for each effect’s main parameter and footswitch jacks. The Powerpod 780 also has 7 balanced mic inputs and 10 line inputs. The 3-band EQ on every channel and a dual 7-band graphic EQ with selectable In/Out switches give you maximum control over your mix. The GSM-1260 speaker offers 100W RMS and 400W peak power handling, a 12-inch woofer, 10 x 4-inch horn, and 3-3" piezo tweeters in a sturdy wooden box. Like other members of the Gemini GSM series, the GSM-1260 provides great sound and great power handling without breaking the bank. The GSM-1260 PA Speaker has push button connectors as well as dual ¼-inch input jacks for easy connecting.